Home » Blog » Why are Pool Cleaning Services Important to Have? Pools are a common feature of many homes in the St. Petersburg area. Pool cleaning services should also be just as common. At a company like Triangle Pool Service, we offer plans that will make sure your waters are clean, safe, and looking crystal clear all year long. Not everyone has time to take care of their pool. However, if you ignore your maintenance for two to three weeks, it will turn green. Often, the green color of the water is due to more than just algae. There can also be other bacteria like E. Coli. We offer pool cleaning services in St. Petersburg that will manage the upkeep of your pool. Our company offers many different maintenance and care plans to fit your needs. Plans include regular cleaning to make sure your waters stay sparkling clean, chemicals, water testing, vacuuming and skimming, and tile and filter cleaning. 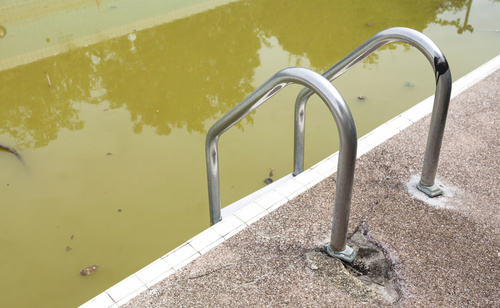 Many people think they can just add chlorine to the water to keep it clean. This is not the case, especially in a sunny city like St. Petersburg. Direct sunlight dissolves chlorine. This means the chlorine you put in the water on Friday could be gone by Sunday. Plus, you must carefully measure the right amount of chlorine and other chemicals based on the amount of water and other conditions, which can vary from day to day. Many people get saltwater pools because they think they do not need maintenance or chlorine. This is not the case. Saltwater pools also require the use of chlorine to kill algae. However, the maintenance of saltwater pools is slightly different than chlorine pools. Saltwater pools benefit greatly from pool cleaning services because their acidity levels require a close watch. Also, they need chemical treatment regularly. In St. Petersburg, trust Triangle take care of your saltwater swimming oasis so you don’t have to. While you do have to spend money on the service itself, having a pool service can end up saving you money. This is because of the costly damage poor care can cause. Ignoring your pool is not just dangerous to your health. If you do not pay attention to your water balance, it can cause your liner to crack. Water that is highly acidic can corrode metal features of your backyard oasis, like ladders and screws. Also, chemical imbalances can crack ceramic tiles and liners. Pool cleaning services will test your waters regularly. They will make sure the proper chemicals are added to keep your water at safe levels. Why Choose Triangle Pool for Your Pool Cleaning Services? At Triangle, we care about our customers as well as their pools. All of our service technicians are certified. They are also trained for any size system. We never hire contractors to complete repairs, and instead train and support our own staff of professionals. Our company is licensed and insured. Contact us online or call us at (727)531-0473 for more information on our residential and commercial services.